Wiring Considerations for Exterior Landscape Lighting | A step by step guide for choosing electrical switches and installing conduit and wiring. A well-landscaped garden loaded with spring or fall color is definitely inspiring during the sunshiny hours, but they can be absolutely stunning at nighttime shown off with exterior landscape lighting. Installing the wiring is your first planning step. Incorporating walkway lights when you install your exterior landscape lighting system makes good sense and many homeowners do this. Putting in lighting as an exterior remodeling project is within the ability of the typical handy homeowner. Always check your local building code to make sure you comply. In many municipalities, electrical building permits and inspections for this type of project arent mandatory. Just be sure to check. Your next question is how long will it take to finish this project? Depending on weather and scope, you might be able to finish it in one day; an extensive project might take one or two weekends. Think about a home security system. Many people discover that this a good opportunity to put in security lighting. Think about Christmas lights. 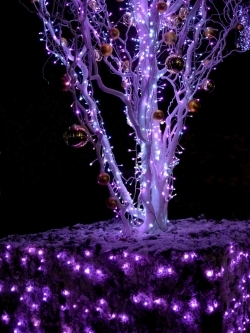 If you want to incorporate holiday decorations in your landscaping rather than just hanging them on the house, consider installing a dedicated circuit. Consider your lighting accents. Begin by drawing a to-scale sketch of your property including the landscaping area under consideration. Choose the lighting technology youe interested it. LED lights are the up-and-coming thing as the technology improves and the energy-efficiency to light output ratio gets better and better. Ive seen four types of switches in common use. Take your choice. Motion-sensors. These are best known for surveillance cams and security lighting applications. A burglar may feel clever scurrying up under dim garden accent lights, but when your megawatt halogen spotlights him, hell likely beat a hasty retreat! Clock-type timers are popular. Timer switches are set to kick in when nobody is home. Just set and forget; very handy when you are on vacation. Standard switches. Toggle on; toggle off. This is as basic as it gets. Photocell automatic switches. These are similar to the aforementioned clock-type timers, but they activate and deactivate with sunlight and darkness. Obviously, outdoor circuits are exposed to water, so they have to be treated a bit differently than indoor wiring. Two kinds of conduit commonly used are PVC and metal. Generally, PVC is a good choice when its buried. Metal is good for above ground scenarios because it stands up well to physical activity like a lawn mower bump. As I mentioned earlier, your local code should be consulted. If you have a weatherproof outside receptacle youre one step ahead; if not, put in a receptacle box. Be sure it is rated for exterior use. Mount it so its safe from the elements and your lawn mower, etc. Locate an electrical source in your house and run your code-specific electrical cable to the box. This circuit should be GFCI (Ground Fault Circuit Interrupter) protected. If the existing circuit running to the box is already protected, youre good to go and you can use a regular receptacle. Otherwise, install a GFCI. Since youve already established your lighting layout, your next step is to put in a receptacle post. Decorative ones are often used. Set it in concrete. Secure a receptacle box and GFCI receptacle on your post. Before digging a trench from your home to the post for your conduit, have your local utility companies locate underground utilities. Many landscaping companies recommend burying your conduit under them to avoid future conflicts. Using a shovel, trench out your most convenient path from your house receptacle to your post receptacle. Lay your conduit in the trench. Connect it to both boxes using code-approved waterproof connectors. Pull your UF electrical cable from your home box to the post box. This is easily done using a fish tape. Make the connections. Install your outdoor receptacle covers using waterproof gaskets.